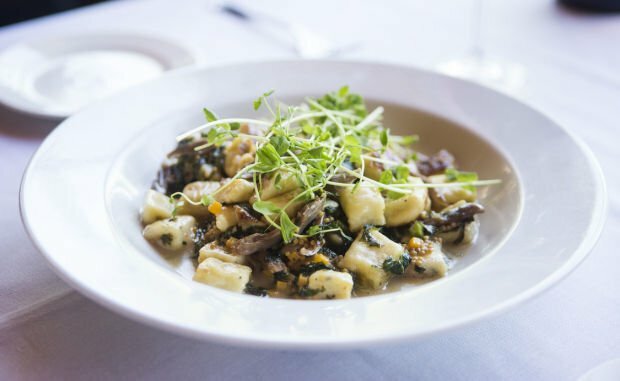 ﻿Gnocchi with duck confit, mustard greens, mustard seeds, pickled butternut squash cooked in a Riesling duck sauce by Jared Scott of Maynards Kitchen. If you ask Jared Scott how he got into cooking, he can’t pinpoint a specific moment. Instead he’ll tell you it was fate. While Colin didn’t cook much more than his “signature dish,” chicken Oscar marked the beginning for Jared. After he got his driver’s license, Jared began working at Firebirds at La Encantada. He then attended the Culinary Institute of America in Hyde Park, New York, a decision he says he didn’t have to think about as it “just clicked.” He returned to Tucson to work as a sous chef for Sam Fox, creator of Fox Restaurant Concepts, at Montana Avenue before it closed in 2011. 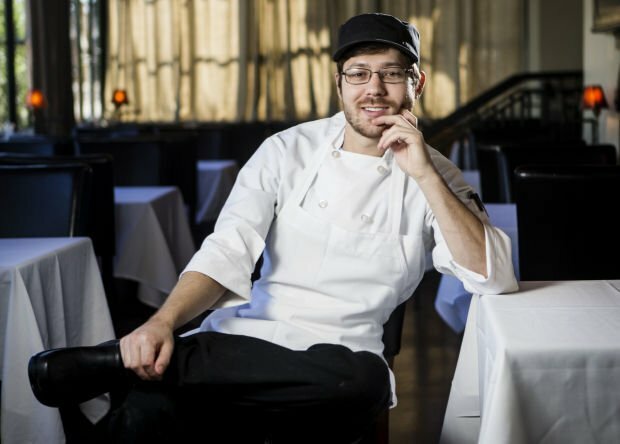 Now 26, Scott is the executive chef of Maynards Market and Kitchen, 400 N. Toole Ave. He joined the restaurant about four years ago and has been the executive chef since March. While he acknowledges he’s accomplished a lot at a young age, Scott “prefers to live in the now” and isn’t really thinking about what’s ahead. “I’ll worry about the end game when I’m 35,” he said. He took some time to answer a few questions. What would you have in your dream kitchen? I’d probably have a 12-burner Vulcan range (oven); I’d probably have a PolyScience immersion circulator; I would definitely have a high-end Cryovac (food packaging system); and I’d probably have a completely separate cooler for Eegee’s, meats and cheeses. Other than that, my No. 1 tool is my hands. I consider myself a pretty giant nerd. I enjoy playing video games. I like sci-fi. I don’t watch much TV; I don’t even have cable. I enjoy movies a lot. If I ever get out into the wilderness, I used to rock climb a lot. What is your idea of a romantic dinner? My girlfriend would say it’s sushi (at Yamato Japanese Restaurant), which is pretty much every Monday for us. Other than that, I usually cook at home. I think it’s fun to use a cutting board or something to plate the entire dinner and share it with your significant other. Justin Sayers is a University of Arizona student who is an apprentice at the Star. Contact him at starapprentice@tucson.com or 573-4117. Wash the potatoes and place them on a sheet tray. Coat the potatoes in salt to help dry them out and season them as they cook. Bake potatoes in a 350 degree oven until soft and fully cooked (about 1 hour). Scoop the potato out of the skins. Using a ricer, rice the potatoes while they are still hot (otherwise the gnocchi dough will become gummy). Combine eggs, flour, thyme and parmesan in a mixing bowl and add to the potatoes. Mix well and the gnocchi should form a slightly sticky dough. Place the dough on a floured surface and knead the dough for about 5 minutes. Then cover the dough with a damp towel and let it rest for 5 minutes to relax the gluten in thedough. Once the dough has relaxed, use a rolling pin to roll the gnocchi out to a large sheet about ¼ inch thick. Using a knife or dough scrapper, cut long rectangle strips from the gnocchi and then roll them into cylinders. Once in round cylinders, use a knife to cut them into small pillow shaped squares. Once cooked, toss the gnocchi into a sauce of your choice and serve.